I have always loved baking, I started making cakes, scones and pastry at a very young age and learnt from any child’s best teacher – my mum! Cookery, Domestic Science, Home Economics, Food Technology – whatever title cooking ever came under at school was always my favourite subject and so I expect that it was no surprise that food and cooking became the career path that I should choose. 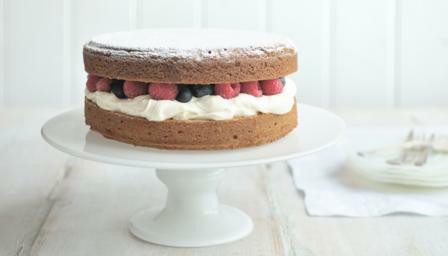 One of the first things I ever learnt – and that I ever taught – in cooking was cake making; there are basically three main methods of cake making – whisking method, rubbing in method and the creamed method, and it is from the latter method that we get the most famous, and most delicious cake the Victoria Sponge Cake. As it’s name implies, the Victoria Sponge got it’s name from Britain’s famous and illustrious queen – Queen Victoria because of her love for a sweet treat with her afternoon tea. Although many people add whipped cream to the jam as a filling to this cake traditionally the only filling used in a true Victoria Sponge is raspberry jam, and the top should be simple dusted with sieved icing sugar. That most revered group of British bakers – the Women’s Institute, hold baking competitions for the best Victoria Sponge cake, this is taken MOST seriously, the cakes must be moist, well risen, buttery and contain only good raspberry jam and a dusting of icing sugar. I make no apologies for the long detailed description of the method of making this quintessential British tea time treat, as it is a cake of such importance – it MUST be made correctly. 1. Preheat the oven to 350F/180C/gas mark 4. 2. Grease and line two 8in sandwich tins with greaseproof or parchment paper. 3. Put the caster sugar and butter into a large mixing bowl and whisk them together with an electric hand whisk until it has become very pale- almost white – in colour. 4. Crack the eggs into a separate small bowl or jug and beat them together using a fork. 5. Using the whisk return to the bowl of creamed sugar and butter and whisk in about 2 tablespoons of the beaten egg until it is totally incorporated, then add another 2 tablespoons of the beaten egg and continue to whisk and add the egg in about 2 tablespoon amounts until it is all in the mixture. 6. Continue until all the egg mixture in incorporated well into the mixture. 7. Whisk in the vanilla. 8. Sift the flour into the bowl with the mixture with a metal spoon, do not beat but fold it in gently, add in the salt and then stir it all in using a spoon until there are no lumps of flour. 8. Stir in the milk. 9. Divide the mixture between the two prepared tins, spreading out evenly and gently with a palate knife. 10. Bake for about 25 minutes until well risen and golden brown. To test if the sponge is done insert a skewer into the middle and if it comes out clean the sponge is ready. 11. When cooked leave them to cool in their tins for 10 minutes, then turn them out, upside down, onto a cooling rack. Leave them to cool completely to room temperature. 12. When the sponges are cool, choose the best sponge cake as the top of the cake. 13. Spread the raspberry jam evenly over the bottom cake. 14. Lay the other cake on top, topside up. Dust with icing sugar and serve. Follow these instructions and you will end up with a Victoria Sponge Cake that the WI and Queen Victoria would be very proud of! 2. Are Protein Shakes worthy Money?